Five academics who have been dismissed by executive order under the state of emergency ongoing in Turkey have been elected to parliament in the Jun. 24 election, news site Evrensel reported on Monday. Academics have been under severe pressure since a state of emergency was declared shortly after the failed Jul. 15, 2016 coup attempt, and thousands have been dismissed from their positions under the state of emergency by arbitrary executive decrees. İbrahim Kaboğlu, a former professor of constitutional law at Istanbul’s Marmara University, was among those dismissed by emergency decree. He was elected as a deputy for the main opposition Republican People’s Party (CHP) for Istanbul. Sezai Temelli, a former associate professor in economics at Istanbul University and the co-chair of the pro-Kurdish opposition Peoples’ Democratic Party (HDP), was elected as a deputy for the eastern Turkish province of Van. Another of the newly elected CHP deputies, Cihangir İslam, was dismissed from the Kafkas University in Kars, eastern Turkey, where he had worked in medicine. Another successful HDP candidate, Erol Katırcıoğlu, was elected on Sunday after losing his position at Marmara University. Ömer Faruk Gergerlioğlu, a dismissed academic and human rights activist, also won a seat for the HDP in the western Turkish province of Kocaeli. 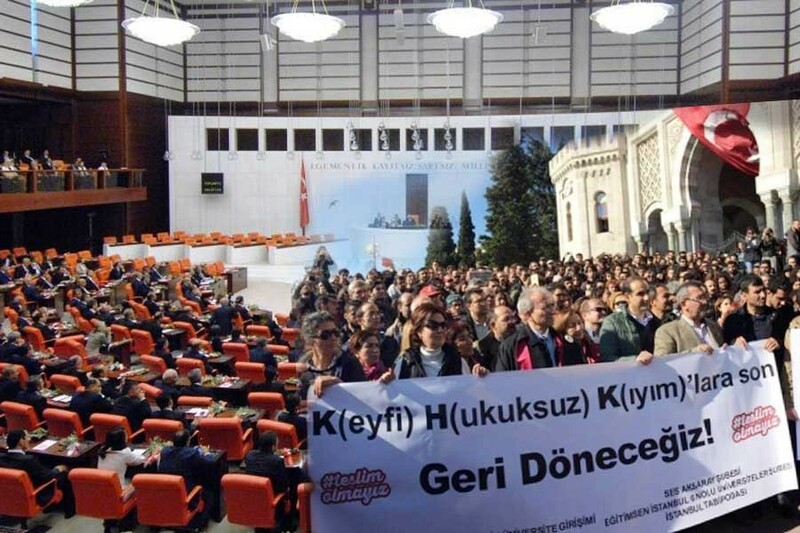 KHK ile gÃ¶revlerinden ihraÃ§ edilen bazÄ± isimler 24 Haziran seÃ§imlerde milletvekilliÄine aday olmuÅtu. Bunlardan 5âi milletvekili olacak.